Lebanon’s president Michel Sleiman says rocket fire from southern Lebanon a violation of UN resolution. Al-Qaeda linked group claims attack. Lebanon’s president condemned on Thursday evening the rocket fire from southern Lebanon at northern Israel, reported the Lebanese Daily Star. Michel Sleiman said the incident was a violation of UNSCR 1701, which brought an end to the Second Lebanon War in 2006, and to Lebanon's sovereignty. The Lebanese president also asked relevant agencies to apprehend the perpetrators behind the attack and refer them to the judiciary, according to the Daily Star. 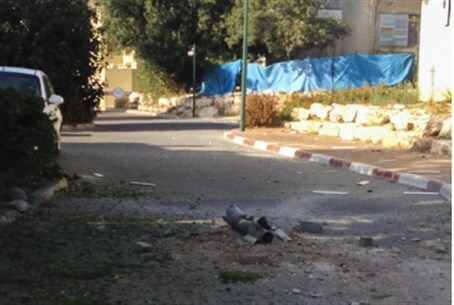 Four rockets were fired from Lebanon on Thursday afternoon, with at least one confirmed as having struck in the area of Nahariya. One rocket was intercepted by the Iron Dome missile defense system, between Akko and Nahariya, the IDF said. Three others struck in "open areas." Several residents were treated for shock. The attack was claimed by the Abdullah Azzam Brigades, an Al-Qaeda-linked terror group which had claimed similar rocket fire on Israel in 2009 and 2011, reported AFP. A member of the group, Sirajeddin Zureykat, made the claim in a statement posted on his Twitter account. While Sleiman condemned the incident, the Lebanese-based Hezbollah terror group would not. A Hezbollah MP, Hasan Fadlallah, said his party was sticking to its policy regarding attacks against Israel. “We do not condemn nor do we support any attack on our Israeli enemy,” Fadlallah told LBCI television. Fadlallah also said Hezbollah did not know the party responsible for the attack.